The Duchess wore Dolce and Gabbana for today’s Remembrance Sunday ceremonies. The annual event honors servicemen and women killed in all conflicts since the First World War. Kate with Princess Alexandra, the Queen’s cousin. There was a significant change to the service this year. 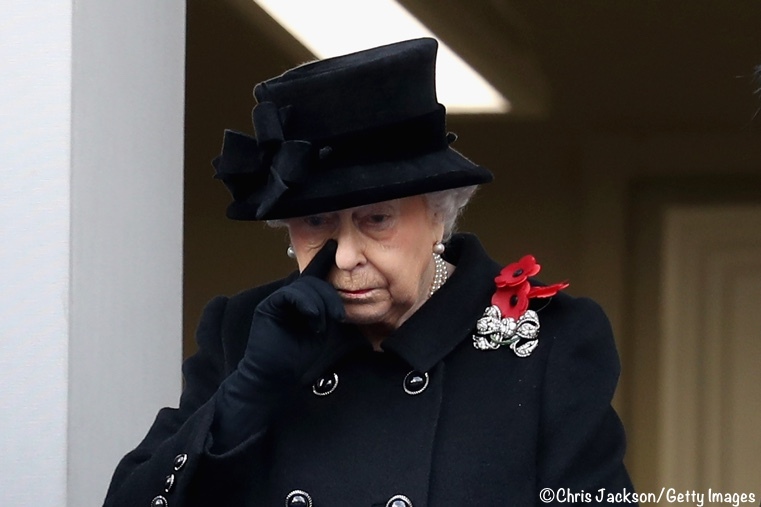 In a historic transfer of royal duties, the 91-year-old monarch stood beside Prince Philip, 96, on a Foreign Office balcony and let Prince Charles lay the first wreath on behalf of his mother as the nation came to a standstill. 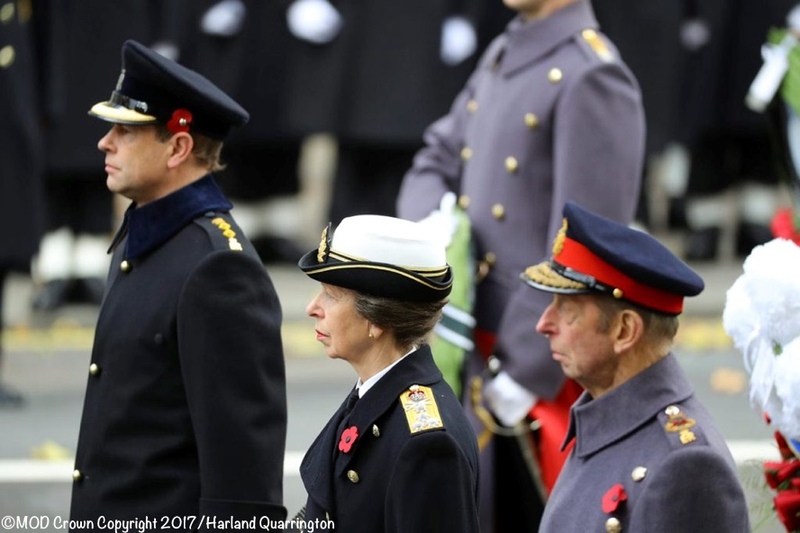 Her role on Remembrance Sunday has since 1952 embodied her place at the heart of the nation as head of state, head of the Armed Forces, and supreme governor of the Church of England. The Duke of Edinburgh and HM. Guests watch from other balconies at the Foreign and Commonwealth Office. Kate and Sophie; the Countess was elegant in black and navy. Kate singing a hymn and observing the ceremony. 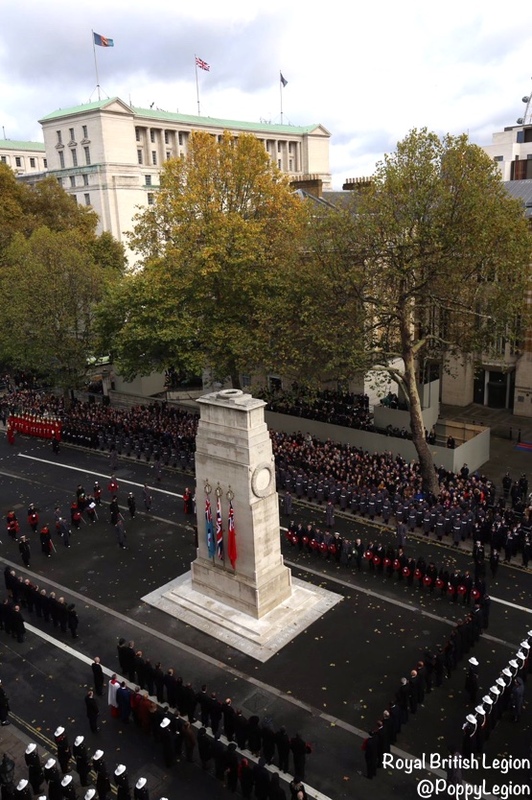 The scene at the Cenotaph, the war memorial in Whitehall, London, just before 11 am. Prince Charles, Princess Anne, the Duke of Kent, Prince William, Prince Edward, and you can just see Prince Harry, as the royals arrive for today’s ceremony. 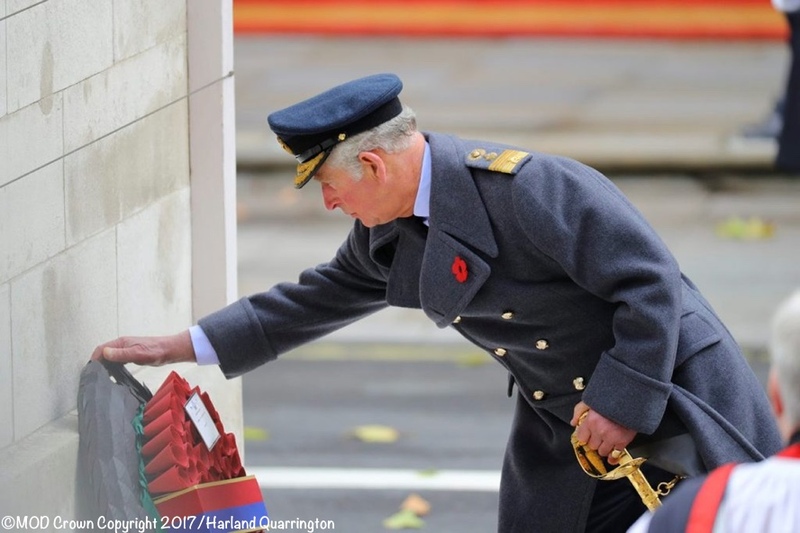 The Prince of Wales placing Her Majesty’s wreath on the memorial. From the left: the Earl of Wessex, Princess Anne and the Duke of Kent. Other royals, dignitaries, and designated service personnel also lay wreaths. Below, Harry and William. 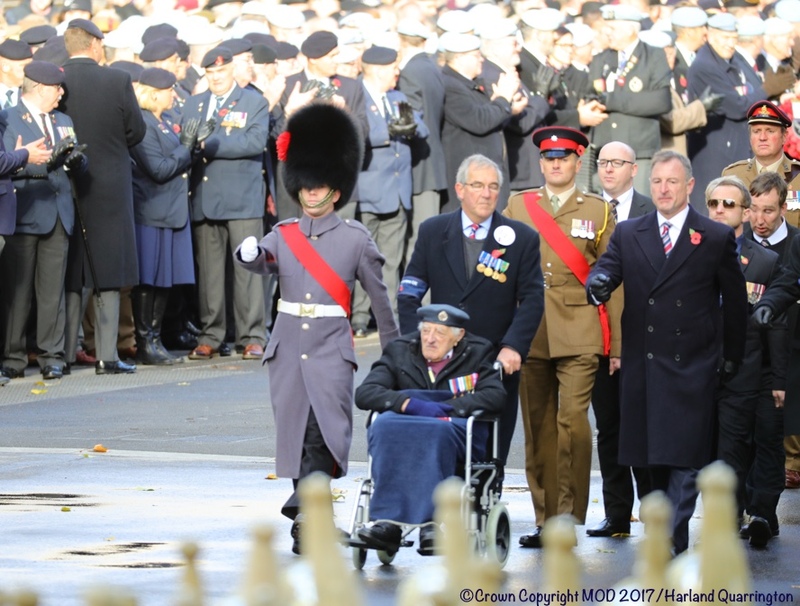 After a 2-minute silence and the ceremony’s conclusion, thousands of veterans from World War II and more recent conflicts march past the Cenotaph to Horse Guards Parade. It was sunny but chilly in London. 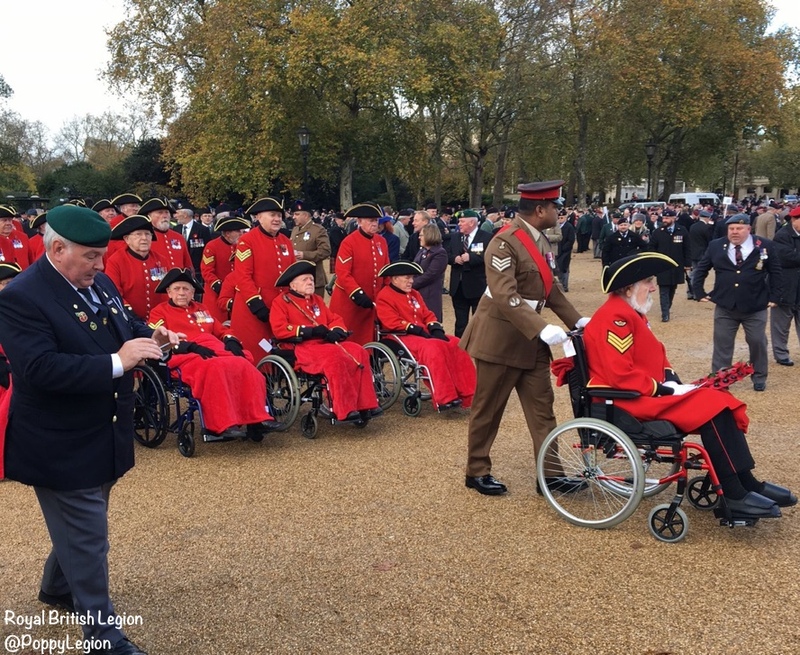 The Chelsea Pensioners in their distinctive coats and hats; all are retired British Army soldiers. 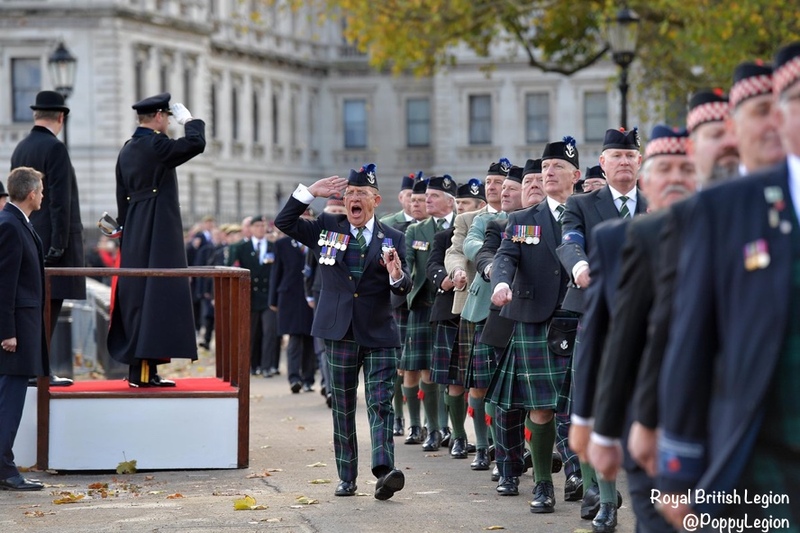 Prince Edward takes the salute as veterans march by. 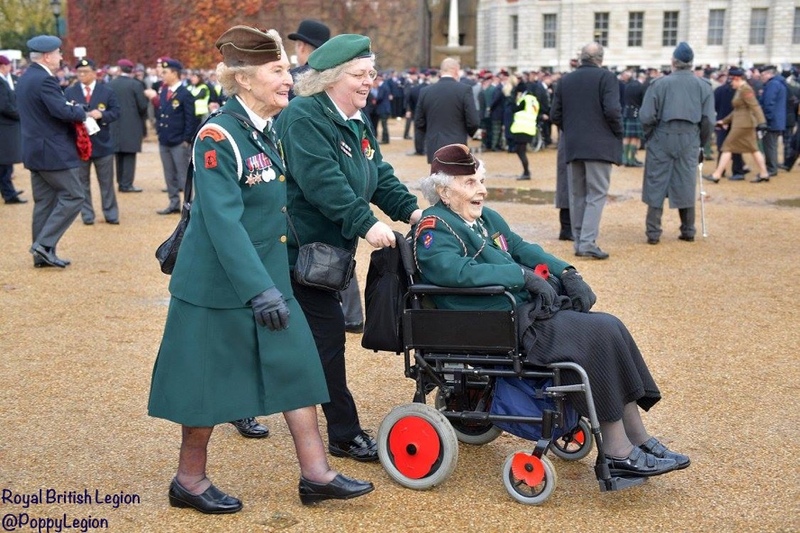 I am forever grateful that I get to look through these magnificent photos of veterans every Remembrance Sunday. They represent all branches of the military. They served in such different times and places. The expressions on their faces are amazing. There are even 4-legged participants. Now we make a tough turn to the topic of what Kate wore for the ceremony. The Duchess was in a new coat by Dolce and Gabbana. The Collarless Long Coat is made from a silk/wool blend. It features a round neckline, fitted bodice, and front pocket flaps. It has long been sold out. Our thanks to Heaven QRF on Twitter and Michelle of Perth’s Fashion for their ID of the coat. This is a piece I don’t think I would have discovered on my own. UPDATE Dec 4: We have not heard back and are now leaning away from the Emmy style. The flap on the Natasha is longer, comes down further on the front of the bag than that on Kate’s bag. Many recognized Kate’s Philip Treacy hat immediately. It was worn when Prince William passed out of Sandhurst in 2006, and again at Remembrance Sunday 2012. Cornelia James confirms the Duchess was wearing the firm’s Beatrice gloves ($92). It’s been several months since we’ve seen Kate wearing gloves; she owns two styles by Cornelia James, the Beatrice, and the Imogen. The company is a royal warrant holder; it has been glove manufacturer to the Queen since 1979. Kate wore her Oscar de la Renta Sun Star earrings ($175). 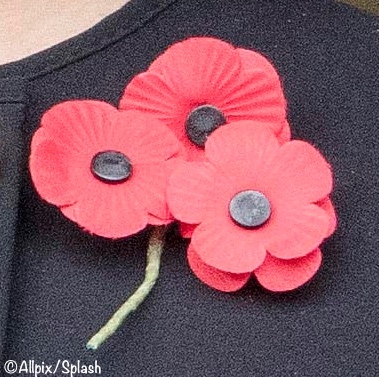 Kate wore the brooch with three poppies we have seen previously. My guess is each represents a family member who served: Prince William, her grandfather, and her grandmother, who was a codebreaker at Bletchley Park. 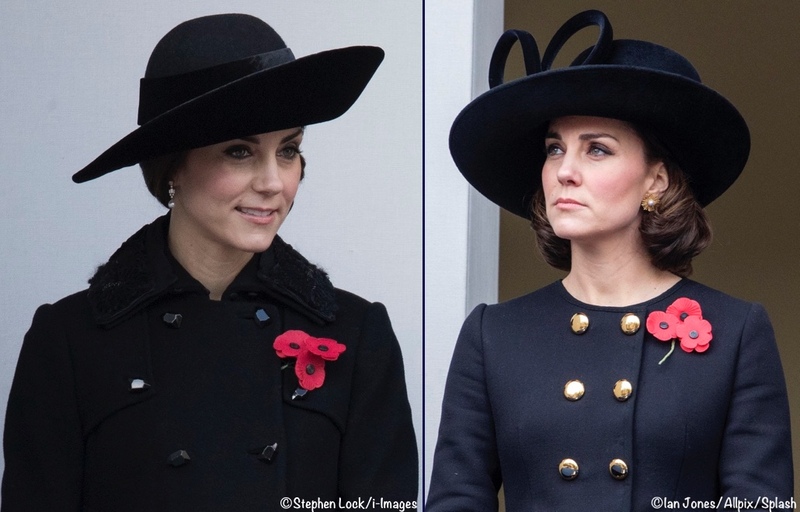 Below, the Duchess wearing the pin last year and again today. 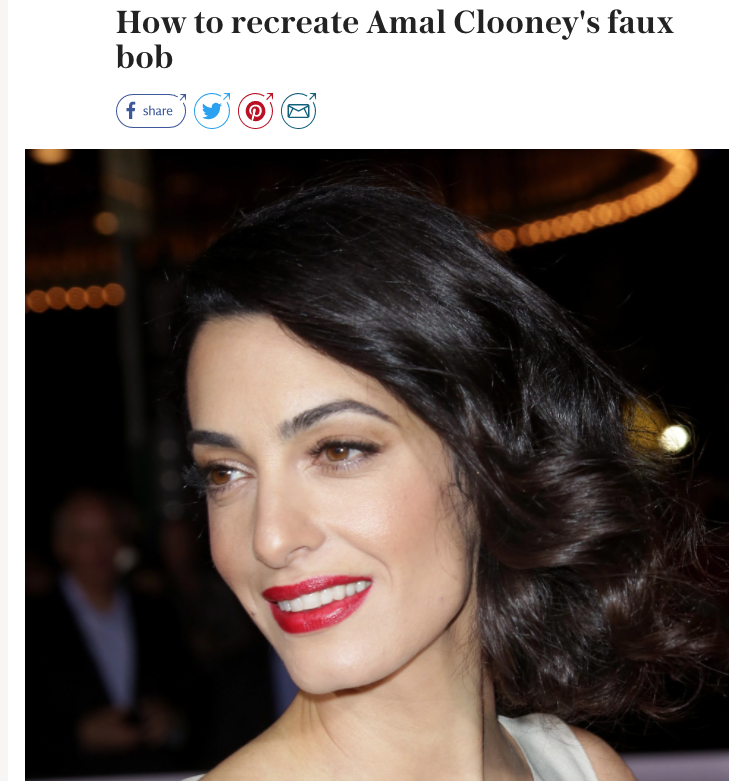 For those interested in Kate’s ‘faux bob’ hairstyle, here is a fab link to a Daily Telegraph story shared by Bonnie, using Amal Clooney’s recent style as an example. 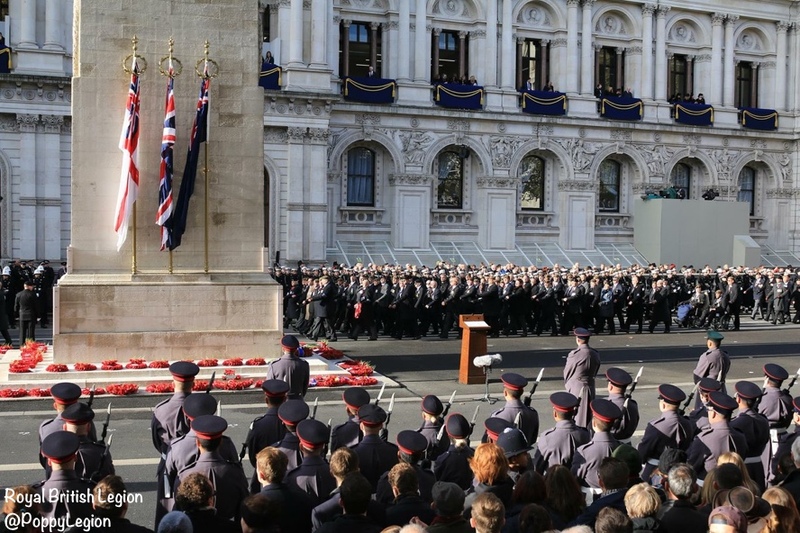 We’ll leave you with this Sky News video of HM laying wreaths at the Cenotaph. The comments that always get me is the ‘aging’ one. Come on, this is a solemn event, you’re not really there to exercise your facial muscles against gravity. The faux bob is fun. A lot of work to do it yourself, but if I had the help, I’d do it everyday. I am less comfortable scrutinizing Kate’s outfits for an occasion such as this. In my opinion, she rarely puts a foot wrong for this event, and all of her outfits have been completely suitable over the years. I do however have to say that I love this jacket, hat, earrings, and hair combo. I would wear that jacket in a heartbeat (although its out of my price range!). I am curious to hear those who say its reminiscent of the 80’s, as to me the jacket looked thoroughly modern. As someone who is DOC’s age, we didn’t exactly live through 80’s womens’ fashion, although we can claim some of the great children’s wear of the day! Solemn, yes, and appropriate for the day. But I am generally not a fan of coats without collars and I don’t care for those buttons or her hair. Thank you for the wonderful post with all of the detail – very well done. Absolutely love the information and detail provided, as always. Thank you. Bless all the veterans who give so much, at times the ultimate, for our freedom. I have no complaints with respect to Kate’s coat, hat, bag, makeup or hairstyle. If it does look a bit Scarlett O’Hara, who on the planet did not want to look like her (in essence, like Vivien Leigh, an ultimate British rose, one of the most fabled beauties ever). The hair is a flattering change for Kate and very appropriate for a solemn occasion. Sophie looks lovely as well. What a gracious and lovely young woman Kate is. Why did you avoid to mention the Duke of York? He was there and laid his wreath. Because he really couldn’t be seen very well in this photo. So this is probably a dumb fashion question, but in the picture of the back of the coat there is a stitched “X” at the bottom of the garment which I think is holding the split together. I always thought that was there for shipping/hanging in the store, but once you take the coat home you are supposed to cut those stitches out. But since they are showing them here in the catalog photo I am wondering if they are to be left in? i have an idea for this site. Can you please consider just putting photos and descriptions of the events that Kate appears at but can you please turn off the comments. No one will ever agree and i think some of the comments are really starting to get nasty and quite disrespectful. Kate is never going to please everyone but this free for all when people can just comment at random about what they like and don’t like is becoming quite annoying. Let’s celebrate the event but keep your comments to yourself. I disagree whole heartedly. People are allowed conflicting opinions, that’s the whole point. The world would be a boring place without them, and a website such as this would hold no value. You may as well read the tabloids if all you want is pictures and information on the event itself. I completely agree with Lulu! The ability of us Kate fans to engage with each other is part of what makes this site so great. Why would you be opposed to people having differing opinions? I’m sure if anyone said something “nasty,” the Admin would remove it. I think the commenters here are very respectful! I agree with Lulu as well. I come here for the comments and to engage in discussion and read feedback on the Duchess’ clothing choices. The discussion means a lot to me. There is the option of not reading the comments if you don’t find them to your taste. While we’re on the subject of things we don’t like, the ad that pops up on the bottom of every screen now is super annoying. I’m not against monetizing a webite, by all means have at it, but that one is just super annoying…and unlike the comments, it’s not optional! I agree Lulu! I generally love Kate’s choices…but like everyone (including myself) sometimes they are misses. This is a fashion website. I think we can all agree we adore Kate and all the great work she does, her beauty, her poise, her grace, etc. — and her outfits are not ones most can buy; commenting makes us feel a bit more connected to her. I don’t think any opinions are mean spirited or disrespectful. For many of us, the comments are a fun and informative part. I learn so much about fashion by reading them. If they bother you, Karly, then it is easy for you to just not look at them. Susan does an excellent job of screening and I disagree with you, that the comments are nasty and disrespectful. Please keep in mind that readers are commenting on Kate’s wardrobe and accessories. They are not commenting on Kate’s character or personality. I am beginning to think that all these Remembrance Day outfits are really the same coat or dress! 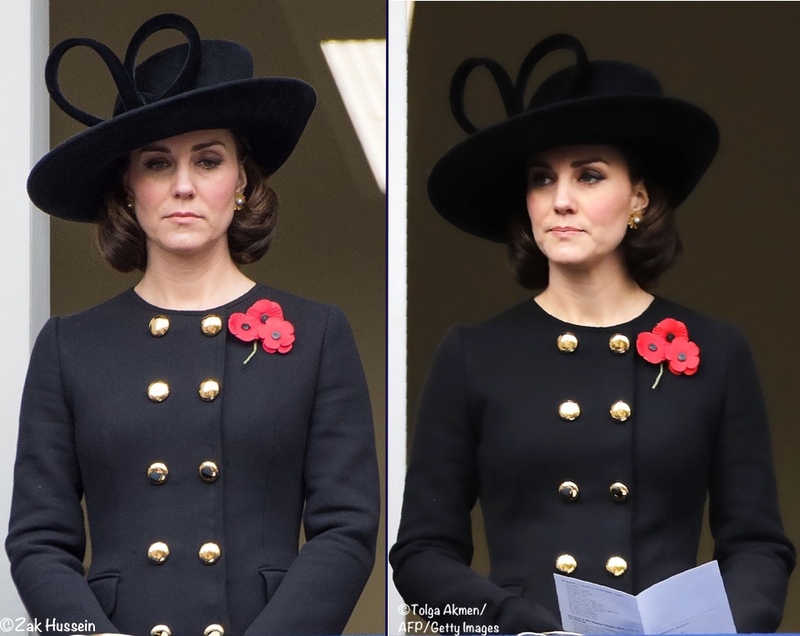 I realize Kate feels the need to be solemn, respectful, and wear black…but she looks the same every year. Sophie manages to change her outfit for this day, I do not understand why Kate must wear a jacket/blazer looking outfit every year. I suppose she is trying to look military like, but it doesn’t always work. I know she likes to match the outfit to the event, but does any one else think she goes overboard with this? ( I don’t mean wearing a specific designer of that country:that’s rather nice and classy) But the event/theme idea, is rather predictable.. When she’s at a water event, she wears nautical. When she is at sporting event, it’s the skinny jeans/wedges/blazer ensemble. When she is at a military event, it’s military attire. When she is with children, it’s a dress like a nursery school teacher. and then the lace for evening outings….It seems too contrived lately. Just my opinion. Any thoughts? I guess the 80’s are back! This is the first time I’ve been impelled to send a comment to this exceptionally well-presented and informative website, after a few years of regular reading. 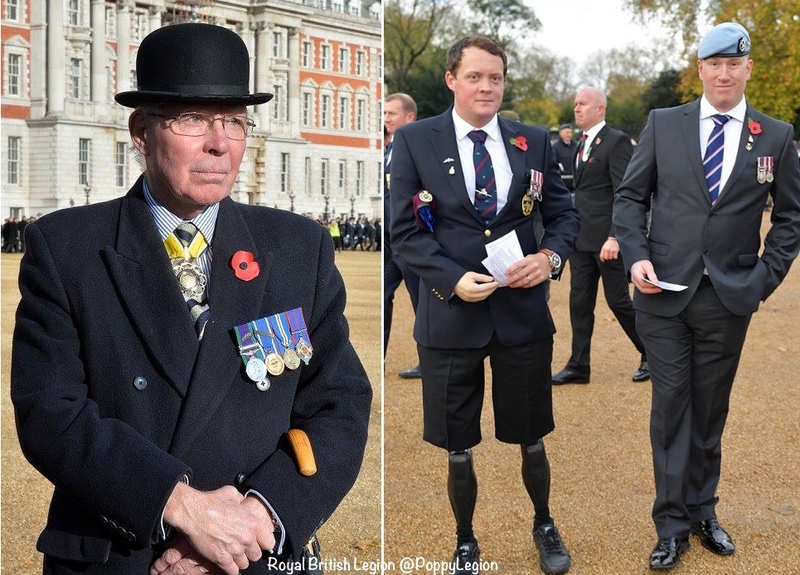 The photographs of veterans, all the background detail and general care taken in providing a full picture of a particularly important royal (and national) occasion — that’s all wonderful and I greatly appreciate it. But what has got me writing is actually my annoyance at all the snide, ill-natured comments that COMPLETELY miss the point of the Duchess of Cambridge’s choice of outfit. She is perfectly, beautifully, appropriately and respectfully turned out for a solemn occasion that is ultimately about the respect owed to every man and woman who ever went to war on behalf of Britain. I am Scottish, and grew up in the countryside, where every community was affected by the loss of their men, sometimes irretrievably so; I was taught when very young to look at the war memorials that stand in every village or just by an isolated church, to stand and read the names. 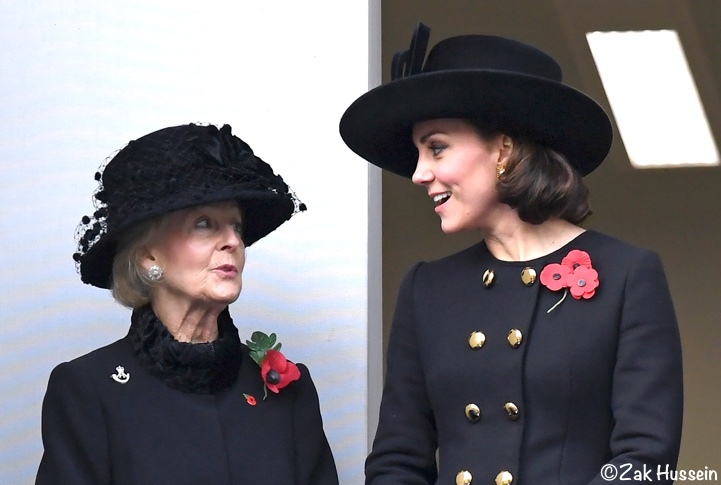 On Remembrance Sunday, the Duchess is not appearing as a fashion plate. She’s there as a symbol of respect, and as usual on such occasions, she has done it with surpassing elegance and, yes, maturity — and, if we must comment on her hair, in that respect her hair is entirely in keeping. Flowing tresses are fine for some occasions, restraint is better on others. In brief, she nailed it. Stop sniping. Totally agree Rosemary. Can’t believe the sniping that is going on. Just for once, let’s be respectful of how others look without the sniping. ….I cannot for one minute appreciate how Kate or anyone else for that matter in the public eye deals with the growing list of people who just think that sniping has become a national past time. I totally agree with Rosemary. She is a member of the Royal Family. 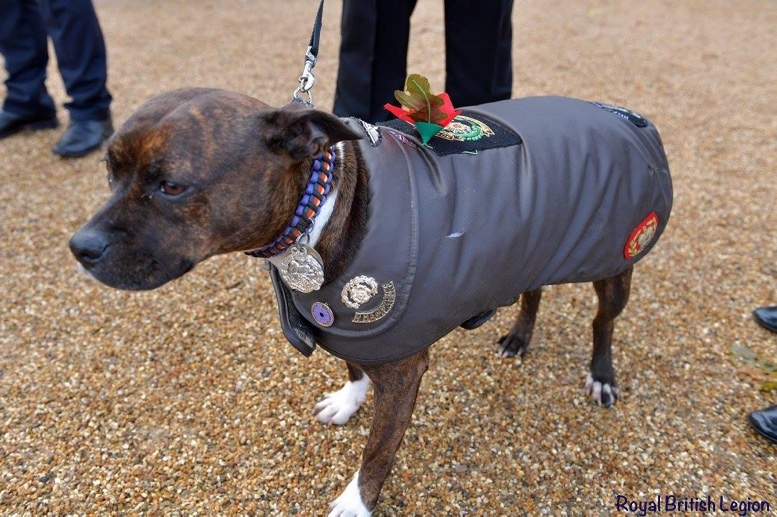 She dressed in a somber and appropriate manner for the Remembrance Sunday. I respect the DOC and her maturity, dignity and grace at such a solemn occasion in Britain. I don’t see ‘snide’ and I don’t see ‘sniping’, this site exists to read about and discuss What Kate Wore. The event is sombre, but we are here to discuss Kate’s clothes. If people find it upsetting to focus on fashion at a sombre event, my respectful suggestion (as everyone is entitled to their respectful opinion) is that, on those occasions, they engage with a blog which does not place an emphasis on clothes☺. I like the faux bob from the side but from the front it looks like 50s housewife. I think the length could be good on Kate if she actually cropped it, but not with the ends flipped up. Her makeup is pretty bad. She looks wan and washed out. I see she has returned to the panda eyeliner, which has never really looked good on her and looks worse as she ages. I am a fan of eyeliner but I myself have also had to scale it back a little as I get older because it starts to look ageing if it is too harsh. The coat is meh. I don’t really understand why she needs yet another black coat. But I’ve always liked that hat. I think the Duchess looks lovely, overall. When she’s pregnant, she has a bit more fullness to her face, which is a good thing. Her clothing is great, including the hat. BUT, the hair, in my opinion, is ridiculous and something she will probably regret. A faux bob is something you do for a costume party or to wear around the house when you are thinking of cutting your hair off but not quite committed to it, but NOT out in public. And the earrings just do NOT go. And the bag, if she has to have one, should be plain, one colour, no contrast piping. As always, the Queen looks wonderful. I think that length of hair is very attractive on her. This day is always so moving to me. We don’t remember are war heroes here in the States with the same amount of ceremony and dignity. But I realize that as a country we haven’t lived through what Britain and Europe have. Thank you so much for your wonderfully comprehensive post! That said, I was very surprised reading the comments to see how many people liked this. I thought it was possibly the worst Kate has ever looked. The hair…just, no. I guess it’s “trendy” if Amal did it too but IMO it looks ridiculous. It reminded me of Scarlett O’Hara when she was pretending to be in mourning. The buttons on that coat scream “1980’s” (and not in a good way), and I’ve always disliked that hat. All in all, I thought she looked about 15 years older in this whole getup. The first thing I thought of when I saw this look was “1980s”! I think it’s the combination of the hat, hair, and buttons. This isn’t my favorite hat, but I didn’t dislike it the last time she wore it. However, for some reason the hairstyle and hat together make her look older, like you said, and the hat comes across as dated, or too big, or something. 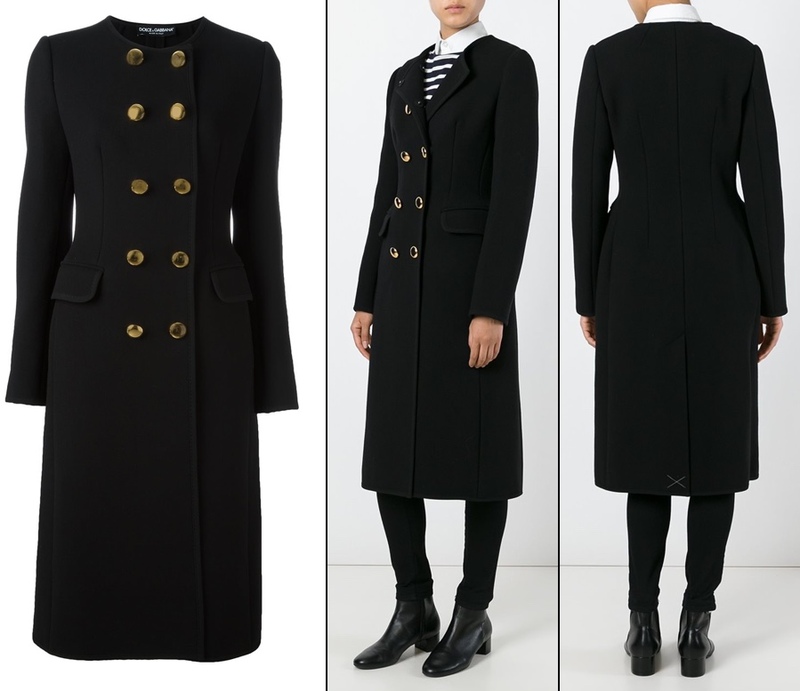 I sort of like the coat, but I think it would look better with different buttons (I like the Queen’s…black with gold outline). Her past outfits for Remembrance Sunday have been much better, in my opinion. I loved that wrap coat too. And I agree, Kate looks Sophie’s age in this out fit and she’s 15 years younger. I thought perhaps the coat had come from her mother closet with the cut of the coat and the brass buttons looking like something from the 80’s. I couldn’t agree with you more. I’ve been disappointed with almost every look of hers for what seems like several years now. I just don’t get it; she has all the money and all the resources in the world, not to mention good looks, but she seems determined to age herself and to appear more matronly. I was shocked by the first picture I saw of her, because I I didn’t already know who she was, I would have thought she was a woman in her 50’s. How could she have gone from looking so fantastic and getting it so right at every engagement in the early years, to getting it so wrong in every way??? Forgive me, but you are all very harsh in your comments. Kate will be 36 in 2 months.She’s on the downhill slide to 40. What I wonder is why you want her to look like her 28 year old self? Or the girl in the Chilvers boots in front of Blenheim Palace? Why is the idea of her aging so awful? 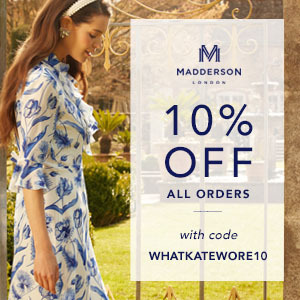 Why does “matronly” sound like a curse word? Not only is Kate almost 36, she’s also pregnant and has been very, very sick. In six years of marriage she’s had two kids and is carrying her third. No matter how pretty she is, how slim she is, and the beautiful clothes and jewelry she has, pregnancy takes a toll both externally and internally, especially in her case. Her coat is a classic and timeless military cut dress coat, which often have gold or brass buttons.It’s perfect for the occasion, and I don’t see a 1980s vibe at all. Just a gorgeous coat I wish was in my closet. And that’s the other thing I don’t quite comprehend — the offense taken if an outfit reminds someone of another decade. Does that mean she’s not “on trend” or “fashion forward?” Her faux bob is certainly on trend, and that doesn’t please, either. I think she looks absolutely lovely and like a future queen. Bravo, Jenny. Let’s cut Kate the same slack we’d like to have if we were in her position. Jenny, with all due respect, you’re putting words in people’s mouths that were not said. No one expects her to look almost a full decade younger than she is! That is plainly ridiculous. For example, I thought she looked beautiful last Christmas. There is an infinite middle ground between college-aged Kate and the incredibly aging outfits she’s been wearing lately. We’re all aware that she’s pregnant; people were commenting on her coat, hair, etc. – nothing that would be impacted greatly by pregnancy, especially since she has a team of people to help her. The earrings are very 80s too. I agree with you…I really liked the wrap jacket! Would love more info on the hairstyle added to the post!! 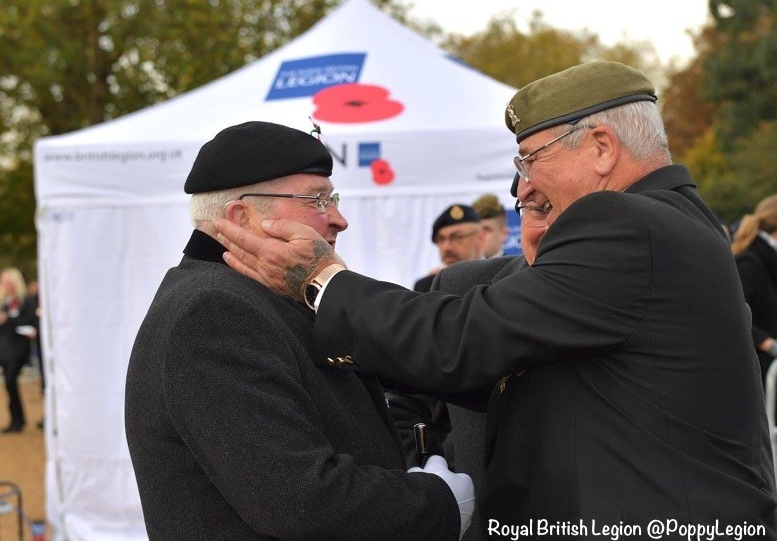 This event always seems so emotional and meaningful for all involved; thanks for sharing all the pictures of the veterans. I don’t like Kate’s hair at all here but the coat is pretty. Catherine’s three poppies could also represent the three branches of the Armed Forces – The Navy, the Army, and the Royal Air Force. I must definitely be in the minority as I’ve never liked this hat, but I do love the coat. 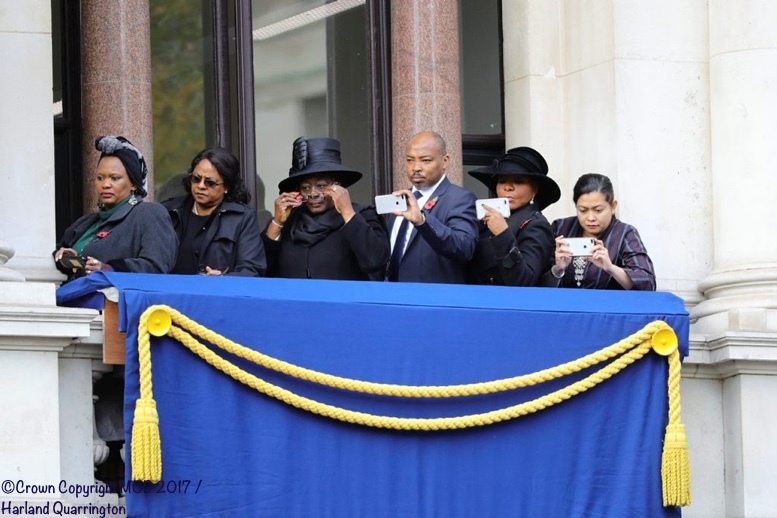 I fail to understand why Catherine needed to carry a clutch just to stand in a window when for the majority of the short time the Royals are present she would have had an Order of Service in her hands. Sophie looked amazing as always. Kate has to travel to the venue via car, travel back home, maybe they all have a lunch afterwards or she has to go meet dignitaries at a private reception. She could have tissues, a compact, etc… something she might need. I was so happy to see Sophie as well in the photo. Thank you Susan for the excellent and poignant coverage of the day. 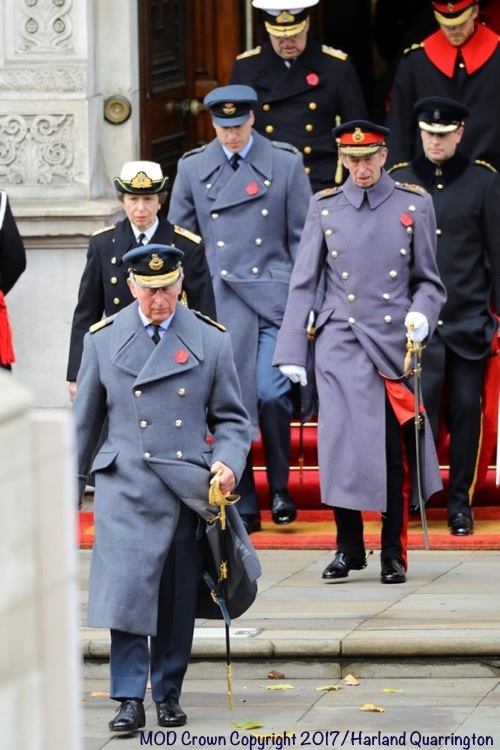 I agree with all the commenters who said that the double row of buttons on the coat and the flaps on the pockets all echoed a military theme—lovely and very appropriate. I think the faux bob is fine with this hat, but not sure it would suit her face shape without the hat. Makeup looked nice today and I like the clutch. However, I really do NOT like those earrings. I realize she needed something yellow gold toned to go with the buttons, but I believe she has many other options that would have worked just fine. They really do not look expensive at all IMO, and I think I could find something more elegant at any boutique in any mall. All in all, I think the duchess looked lovely and appropriate but I think a different earring would have been better. I also echo those who thanked our admin for reporting on and posting pictures of all the veterans—such a poignant event today. Agree with all your points, Katefanatic. Not a fan of the earrings either. They look exactly like what they are- costume jewelry. LOVE LOVE LOVE the hair! I’ve been waiting very long to see her wear it in a style like this, very elegant, goes well with the hat and is appropriate for the event. I waited long to see her try out some different things with her hair! She has beautiful hair, why not style it variedly?! I’d also love to see it without the hat, though, to get an impression on how it works for her face! The coat is on point and the hat good for the balcony as it looks nice seen from close and seen in the back of the crowd. I cried looking at all of the photos you included of the veterans, especially the 4-pawed ones. Everyone forgets about the 4-pawed ones and I basically lost it. Their expressions say so much. I come from a huge military family and we represent every war since the First Great War (or WWI), so I get so teary eyed looking at photos. Uuuuuuuuugh. Okay, I won’t cry anymore. I love how her hair is done. I want to know how they did that. Did they pin it up that way? Sometimes I wish we could just interview her hairstylist! Like your take on the meaning of 3 poppies as real meaning unknown. Mostly though it represents the 3 armed forces, Navy,Army and Air Force. A terrific outfit in every way. I think the Duchess looks wonderful in wide hats when they’re paired with a low-collar or collarless coat, and I’ve always liked this one, too. And her hair looked beautiful. I confess I’m glad to hear that it might be a faux bob. I have liked her short-er hair recently but it still looked youthful and full. I think an actual cut as short as this tuck-up today would be too middle-aged for her at this point. In a few years, maybe! 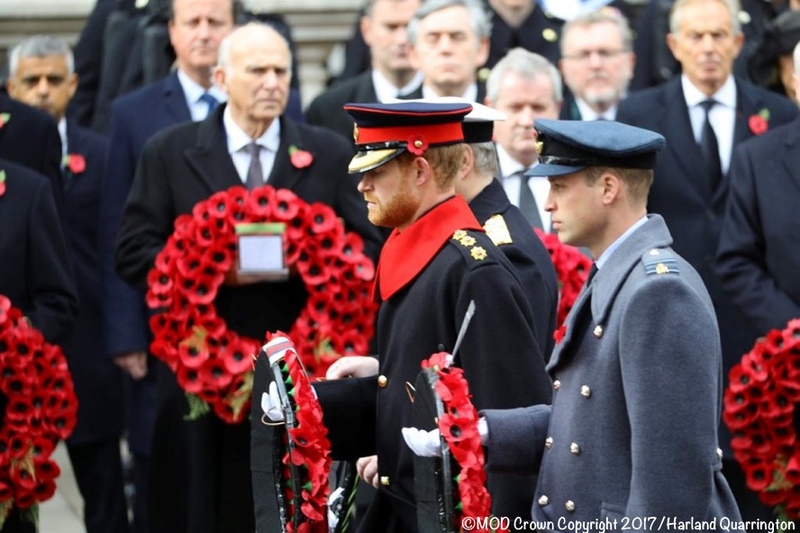 The ceremony is very moving and I’m glad the Queen turned laying the wreath over to Prince Charles while she and the Duke of Edinburgh are able to be present. It combines change with continuity and is a wonderfully wise choice. Your last sentence is beautifully stated. I’m starting to notice some inspiration from Jackie O’ in Kate’s outfits and hair. This hair do def screams Jackie o to me, it a great way! There have been many other outfits in the past that reminded me of Jackie o as well. The hair here is so tough to figure out, like the did a big curl and tucked the rest under. I haven’t really seen anything like that before and it’s so pretty! Amal Clooney has also been wearing a faux bob. The website below shows Amal and others wearing this style and there are directions on how to do it. I love love the faux bob! Everything works, and she looks very elegant and classic on such a solemn occasion. I love this hat. It looks better every time she wears it – I think because it was a style slightly too mature for Kate in 2006, and she has “grown into it” perfectly. A pared back, elegant, stately look. Perfect. Thank you for posting all the photos of the veterans! I love seeing the diversity reflected there in terms of age and gender. This is the duchess i have been waiting for. Kate looked amazing today. Beautifully written and reported. The Duchess looked quite perfect. Elegant and appropriate. She looks great. Very polished. Not a fan of those earrings but they work really well with this outfit. As for the hair, the style looks great with the hat and severity of the coat, however even though it is called a faux bob, an actual bob does not look anything like that. It is clearly very full and puffy and tucked under. All the puff of the, what I would call a relaxed updo, balances out the wide brim of the hat and softens the coat, hat and Kate’s face. An actual bob would not look like this.This might be a repeat. Beautiful post, Susan. Thank-you for sharing the human side of this day in words and in pictures. On the Kate side…that cute hair!!! I agree. The hair looks so wonderful at that length! Beautiful and perfectly suited outfit. Firstly, thank you to the admin who seems to have the perfect balance of covering the event and the fashion – not an easy task. This Canadian tips her hat to you. The fashion choice by Kate was perfect. Not only does it suit the occasion, it is of impeccable tailoring and she stands out as the lead Royal. She really has come into her own these past few years. thank you for observing the importance of the event and the placement of a bow on a glove, tilt of a hat or the age of a garment is purely and totally irrelevant. Thank you for this post. Do you know what shoes/boots Kate is wearing? 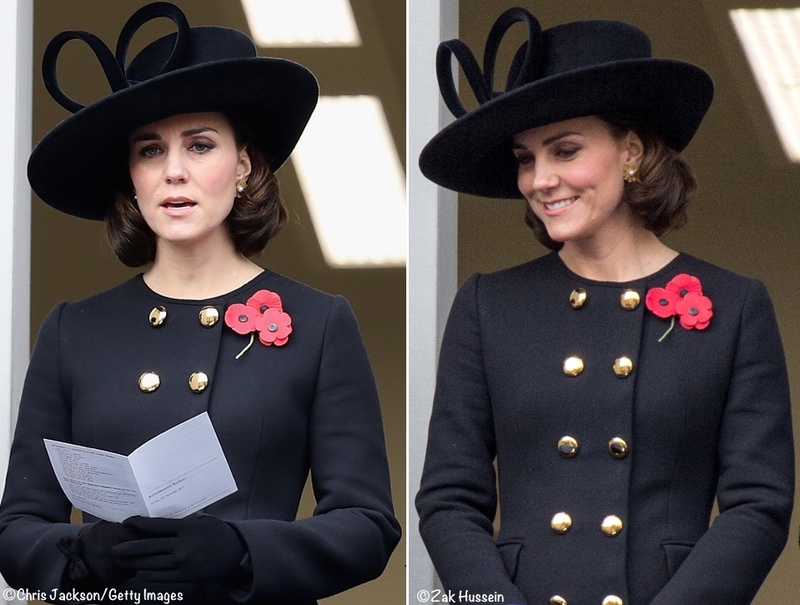 This is my favorite Remembrance Sunday look Kate has EVER worn. I look forward to seeing last year’s hat paired with this coat at some point in the next few years. This look marks a new “maturity” to the Duchess…not that she wasn’t respectful, appropriately dressed, etc., in the past, but it is a FAR cry from the beret and ringlets she sported in 2013. She looks like a proper lady, the future of the monarchy. I wonder if her new right-hand-woman had any influence in this look? I have to say, I’ve noticed a new confidence and strength from Kate in her past few engagements, whether that’s from pregnancy, experience, her new aide, or a combination of the three…she needs to keep on whatever she’s doing now. It’s working. I agree with you Alyssa, 100%. I can’t get over Kate’s look today. I just love it!! That hair style with the hat and the collarless coat.. she always looks perfect for these occasions. Fantastic post on a solemn event! This look is absolutely appropriate for the event, and beautiful too. Thank you as well for sharing so many pictures of the veterans. A truly fabulous choice of coat by Kate, the fit is exquisite. I’m pleased to see a second jewel neck from her in one weekend, a sophisticated choice in my view and brilliantly cut here, a little low at the throat. The double row of military-style buttons are perfect for the occasion. 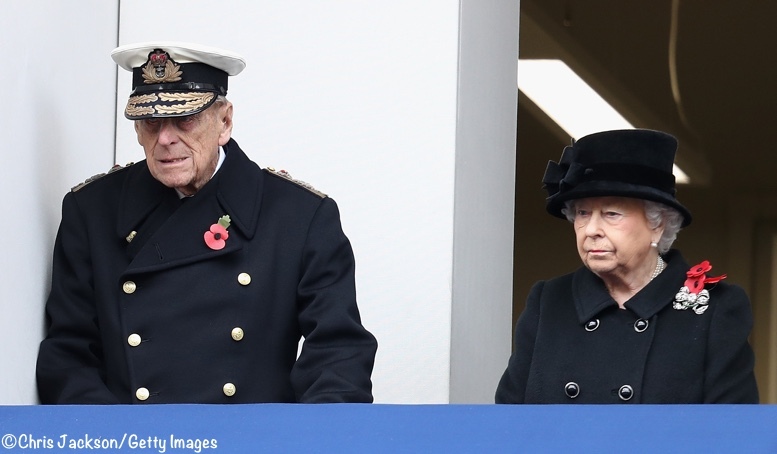 I love seeing the Treacy hat again and am struck how it manages to switch from relatively celebratory to solemn, and both in a military context. My one gripe is that I just can’t stand fussy bows on gloves – definitely not sophisticated or military — but they blend in here against the lean lines of the coat, and can mercifully disappear up the sleeves. The earrings are lovely, their slight spikiness pointing up those clean D&G lines. The faux bob works wonderfully well and is a neat way of ringing the change in updos The Duchess looked simply stunning today. Everyone looks very smart and nicely turned out for what I think is the most important occasion of the year. I’m glad Kate made it to this and last nights ceremony. Thank you for the coverage. I do like Kate’s hair – if it is a faux bob, she should consider trimming it to that length for a change. It really suits her and looking at the comparisons with her hat, this hair length looks best of all. I agree about the hair cut it ! Lovely post. Thank you for making it more about the observance than about the fashion. I always stalk the page and never comment. I know nothing about fashion, but love to her others input. This look suits her very well. I love the hat and coat. I don’t really know what hairstyle she’s wearing, but she pulls it off well. I always think she looks her best when she’s pregnant. That little extra weight does her good. Kate looked fabulous, I love the new coat, just wish it was in my price range. 🙂 Wonderful article with excellent photos. Thank you. Thank you very much for a great post! Remembrance Day has a special place in my heart. My father fought in World War II in the Burma Campaign. Just as an aside – the duchess looks fabulous with a bob – I read somewhere it’s a “fake” bob. Whatever it is – it suits her. Is Kate’s hair in an soft updo or is it curled to be that short? It looks lovely with that hat. I…that’s a faux bob, isn’t it? I think my mind will be blown if it isn’t. I JUST LOVE these earrings and I don’t care who knows it. The big brass buttons are not my taste, but the hat is a longtime favorite. I love a Lady Sybil reference…and yes, most definitely a compliment! Agree that those starburst earrings are gorgeous. Wholly agree with the Lady Sibyl comparison — perfect!! Kate looks very elegant and appropriate at today’s solemn ceremony. The gold buttons and earrings add a touch of pizazz to an otherwise sedate outfit. I especially like her hat, even though she’s had it for over ten years. A brimmed hat, that frames her pretty face, seems to compliment her more than a small hat perched on her head. I also like her hair. It is very feminine, but also very professional. Makes me think she’d look great with a much shorter bob. 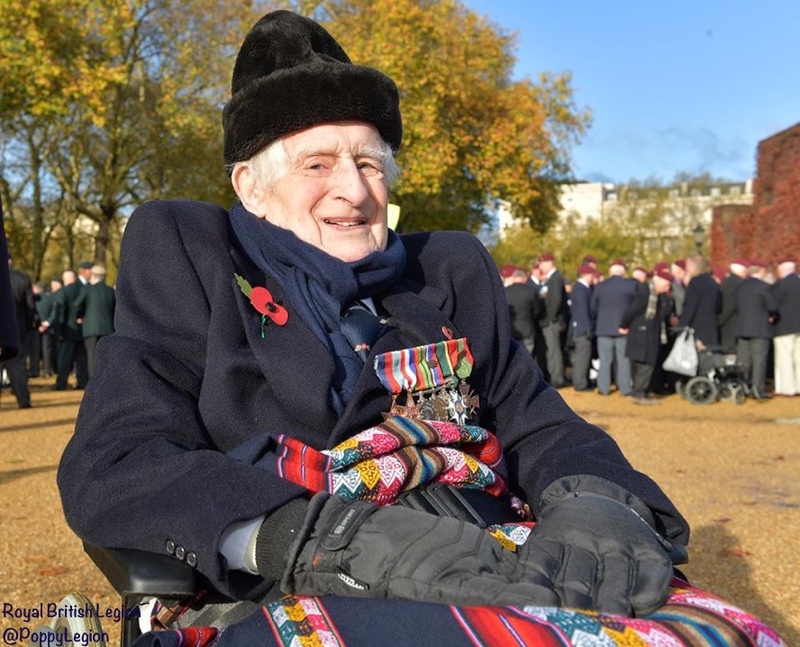 It is heartwarming to see the aging veterans and have their service recognized. 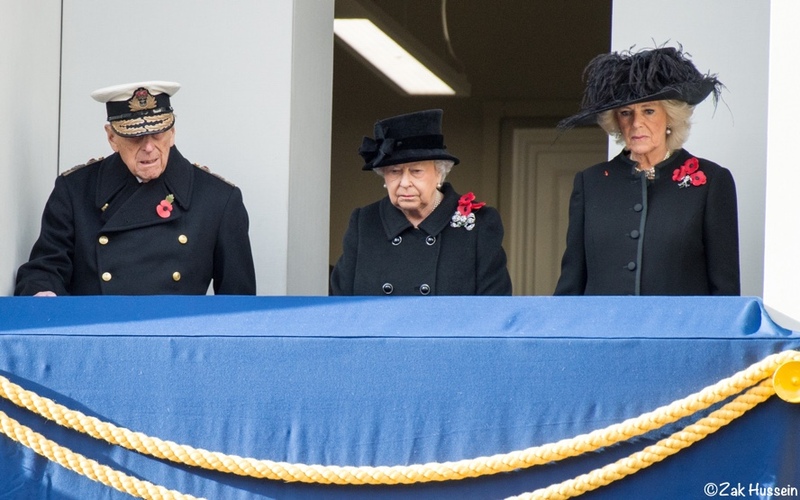 I can’t help but notice how frail Prince Philip looks. It is so good, that although he officially retired at the age of 96, he is still by the Queen’s side for important events. Elegant and demure…a striking and solemn look for a somber event. I enjoyed the bobbed look for the Duchess’s hair. It looked polished and out of the way of a breeze, but softer than an updo. 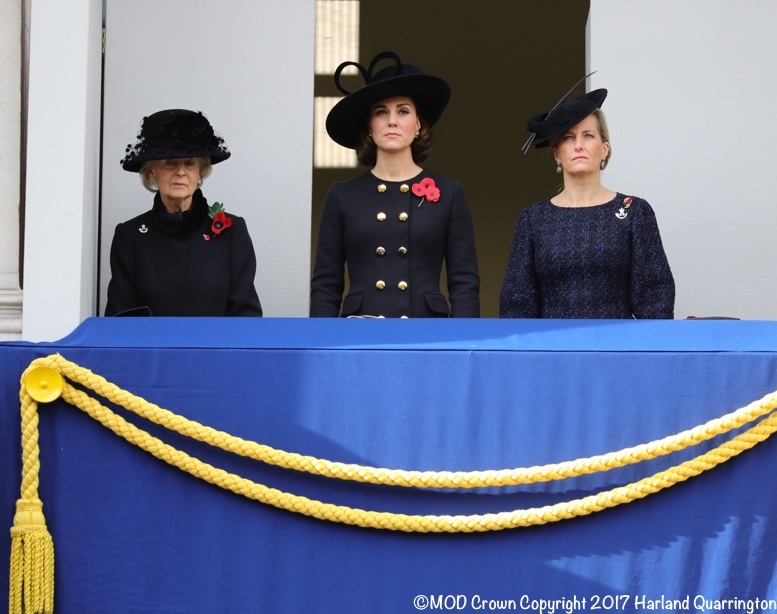 I thought the buttons on Kate’s coat – as well as the Queen’s and Prince Edward’s coats – looked quite military style, which suited this event wonderfully. I think we all are sitting up and taking notice of the slow ‘changing of the guard’ as the Queen hands over certain royal duties to Prince Charles. It is certainly forward- thinking and necessary, but a bit sad to know her reign (long may it continue!) is nearing its end. She is such a treasure. And of course those pocket flaps are consistent with the great heavy military overcoats the men are wearing. To me, it looks like gold piping not white. Gold piping? Well, then I guess I can live with it 🙂 And in future I really must read the post more carefully! Lovely coat. 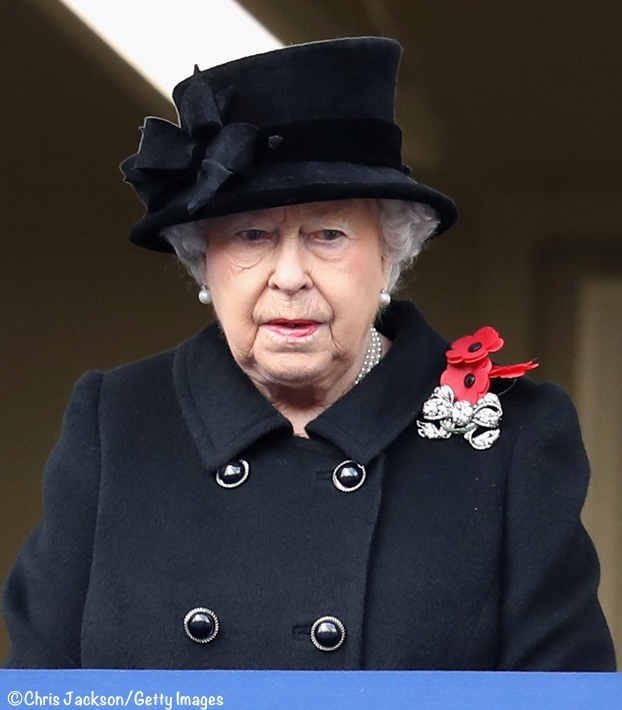 She and the Queen are similarly attired:double breasted coats and triple poppies. I noticed that too, the similarity between the choices of the Queen and the Duchess. Kate really stood out. Beautiful post! Thank you for the photographs and for sharing your thoughts with us!